Moreover, help with updating the wiki page for migration from 4.4 to 5.0 as well as what is new in 5.0 is very appreciated. More updates about them very soon.Many thanks to everyone involved in development of 5.0 and the early testers that played with master branch so far.Thank you for flying Kamailio!Looking forward to meeting many of you at Kamailio World 2017! Helping with testing the RPC commands is very appreciated — open an issue on bug tracker whenever you discover a problem.Thanks for flying Kamailio! 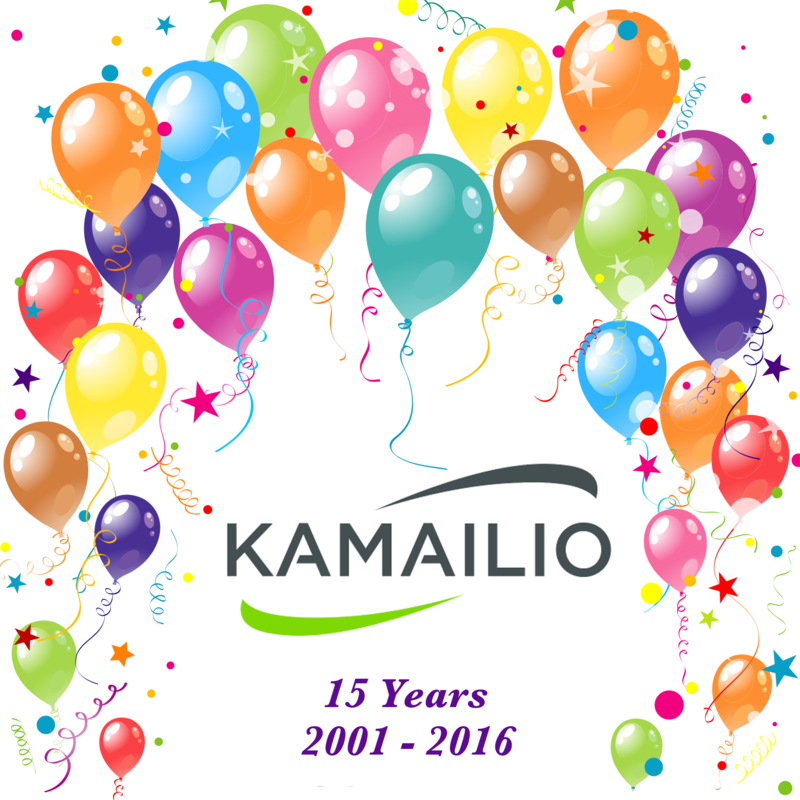 2016 has reached its end, a special one for Kamailio by celebrating 15 years of development! Thank you everyone for contributing to the project!We are looking forward to a great 2017, the release of v5.0.0 is around the corner! We wish a healthy and prosperous year 2017 to all Kamailio friends, hoping to meet many of you at Kamailio World Conference and other events around the globe!Thanks for flying Kamailio!Enjoy and stay safe!Happy New Year! Passing the 15 years of development marker for Kamailio project few months ago, we are now approaching the end of 2016. A long list of people devoted a lot of time in sustaining the project with resources for development, support and advertising. So this is a good moment to thank and greet them, everyone involved in Kamailio project, old and new friends, developers, contributors, the engaged and warm community members.We are very close to the moment of freezing the version 5.0.0, a new major milestone in the project evolution, with a restructured source code tree, cleaner and slimmer code base, a new flexible configuration file framework that allows building SIP routing script in embedded languages such as Lua and Python, a.s.o. – all making a very solid foundation for developing next releases! 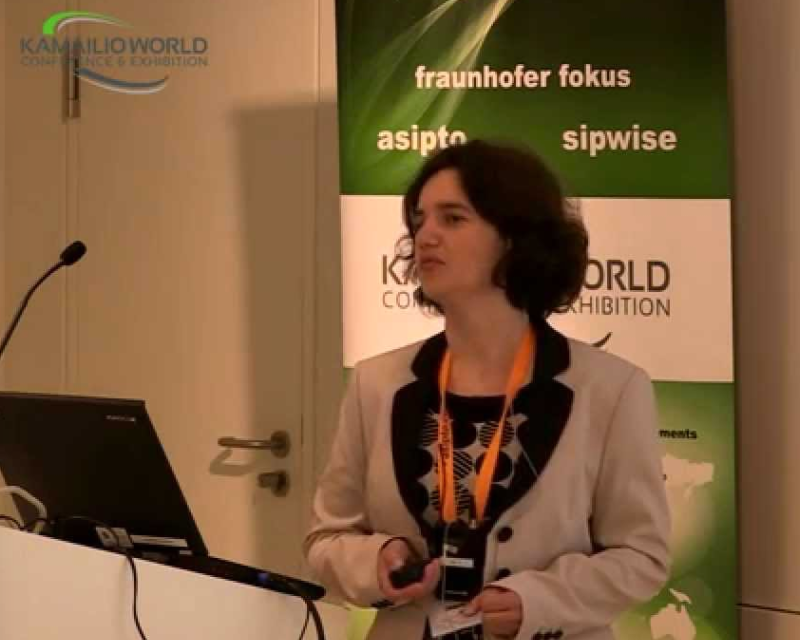 Good premises to expect a lot of new stuff in 2017!The 5th edition of Kamailio World Conference, the project’s annual event, is scheduled for May 8-10, 2017, in Berlin, Germany. We look forward to meeting many of the community members there!Merry Christmas and Happy Winter Holidays!Santa is flying Kamailio! If you were using mi_fifo or mi_datagram modules, then you can switch to jsonrpcs module (it offers the transports for the two mi modules). If you were using mi_xmlrpc, then you can switch to xmlrpc module.Thanks for flying Kamailio! ./src/kamailio -f etc/kamailio.cfg -L src/modules/ -E -e -dddWhile some small adjustments may still be done, we hope that the new structure is going to make the long term management and development of the project smoother.Thank you for flying Kamailio! As a side note, the organizing of the 5th edition of Kamailio World Conference has started, being planned for May 8-10, 2017, in Berlin, Germany. More details will be available in the near future!Thanks for flying Kamailio! Add there the topics that you want to be discussed and your availability.Thanks for flying Kamailio! If you are interested in Kamailio snaps, join our development community on sr-dev mailing list.Thank you for flying Kamailio! This year, the focus is on understanding application drivers and technology evolution towards softwarized 5G networks and the industrial internet revolution.This year the FUSECO Forum will be accompanied by 2 additional international events on 5G, all of them held during the same week in Berlin. Don´t miss any of them and get ready for 5G and the Industrial Internet of Things! 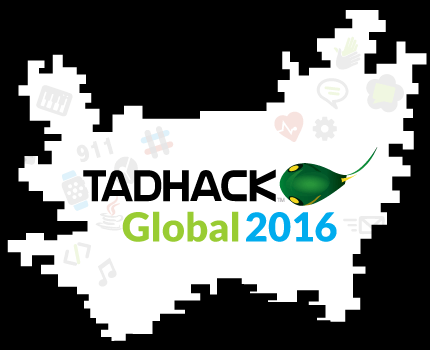 TADHack is the global meeting place for developers who want to learn, share, code and create using the tools and technologies available in telecommunications.The Berlin event is hosted by VoIP Lab, part of Buro 2.0 co-working space, being coordinated by Dennis P. Kersten during October 15-16, 2016.Several Kamailio developers from Berlin area are participating to the event. Any developer can participate for free, you are welcome to join us in Berlin or anywhere around the world — you can do it also remotely, from your living room or your preferred working space. Think about an idea to code, hack and demo it for wining some nice goodies from sponsors!Happy telecom hacking! Kamailio incorporates a module with the same name, kazoo, but besides it, the developers from Kazoo project contributed a consistent effort in advancing the presence and database modules. Therefore expect to meet a lot of Kamailio friends around at KazooCon and participate in many interesting discussions.Thanks for flying Kamailio! The module is a result of a joint development between Carsten Bock and Stefan Mititelu. If offers AMQP communication from kamailio.cfg using librabbitmq, allowing to interact using a well establish message queuing mechanism with external applications.Enjoy! The Asterisk Users Conference – AstriCon – is taking place in Glendale, Arizona, during September 27-29, 2016.With a consistent group of VoIP community using both Kamailio and Asterisk projects, Kamailio will have again a strong presence on site this year, including the participation in the expo floor, coordinated this edition by Fred Posner.Along with him, you may meet around Torrey Searle, Nir Simionovich, Joran Vinzens and others that can answer your questions about Kamailio and Asterisk. Like in the past editions, several presentations will touch the use of Kamailio and integration with Asterisk — see agenda.It is definitely a must-attend event if you are looking to build flexible real time communications using Kamailio and Asterisk, or even beyond that, there are not many places around the world where you can find so much VoIP knowledge at the same time along the year! e60a972 Andrei Pelinescu-Onciul Tue Sep 4 20:55:41 2001 +0000 First working releaseThe project was initially named SIP Express Router (aka SER), years later – after a fork, a rename and a merge – it converged into into what is now the Kamailio project. It has been a fabulous journey so far, in a more than ever challenging market of real time communications.Well known for its performances, flexibility and stability, Kamailio has set a relevant footprint in open source and open communications, enabling entities world wide to prototype, launch new services and build scalable businesses, research and innovate in real time communications. 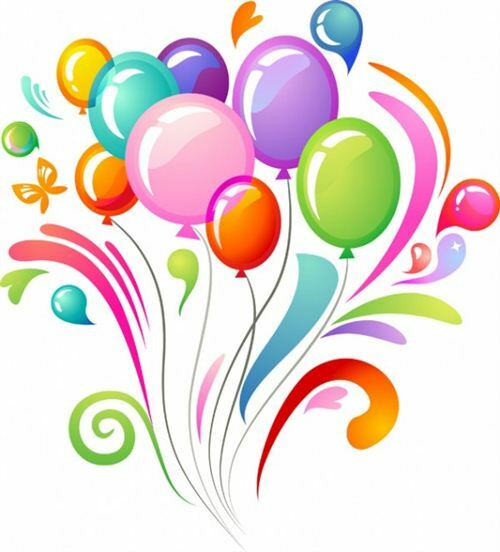 More over, the project has succeeded to create an amazing community of users and contributors, the real engine behind its successful evolution.Its time to celebrate the moment, everyone involved deserving it — thank you all!In a few months the project will deliver v5.0.0, its 16th public major release, with a restructuring of the source tree to match current modern approaches and more flexibility in choosing the language for building the desired SIP routing rules. Stay tuned!Thank you for flying Kamailio!